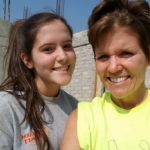 For the first week of 2018, I was privileged to spend the week with 20 other people, including my 16-year-old daughter Anna, on a service trip to Refuge Ranch in Mexico. Refuge Ranch provides a home for abandoned children. Their goal is to support even more children, which requires a new home. This was my fifth year going to Refuge Ranch. I was excited to share the experience with Anna, and knew it would have a profound effect on her as well. She received a writing assignment, and she chose to include thoughts from her trip to Mexico in her paper about happiness. With her permission, I’d like to share a few sections with you. What is happiness? To me, happiness is being content with life in general. It is not about how much money you have, or if you have the most clothes, or if you travel far and wide. Happiness can also be manipulated. People can choose to be happy with what they have and where they are in life, or they can complain and be upset. Happiness is a personal mindset that every human experiences. There are many things that mean happiness to me. There is happiness in helping other people. Helping other people can cure the soul because the joy it brings to others fills the heart. I recently spent a week in Tepetlixpa, Mexico. 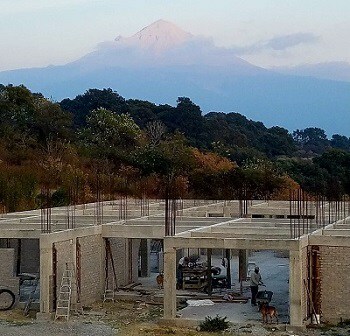 During my week in Mexico, I volunteered at a ranch where we spent our time constructing cement columns for a new house and plastering walls. My week in this place showed me again just how blessed I was and how people who had so much less than me seemed more content. One of the people I met in Mexico was Cirino. He works for the ranch and is part of the three-man crew that is building the new house. Although we could not communicate very well with him because of language barriers, you could tell Cirino was a content and happy man. He was always smiling and laughed with us when we attempted to talk in Spanish. Cirino lived in a house down the road from the ranch that was constructed of tarps and walls with dirt floors. Cirino easily could have fixed the dirt floors of his house but he was fulfilled with what he had. The people in Mexico live a life much different from ours. They do not materialize their lives, they do not base their happiness in money. They do not compare their lives to their neighbor’s. Instead, they live their lives happily. They go to work and do their jobs and go home and see their family and the next day they do it all over again. My trip to Mexico showed me how simplicity can create happiness. When humans live simply and do not overthink, we can live a happier life. Our society has warped happiness into an unreachable goal. There are people in this world who do not know where their next meal is coming from, or who their real family is. I challenge whoever is reading this to take a step back and evaluate your life. Do not compare your life to someone else’s. Do not think that materialistic items will bring you joy. Instead, start every day with a smile because every day is a chance to love the life you live, and live the life you love. Is your life reflecting all that you want and desire? If not, perhaps it is because you are not clear about who you are, and what you want out of life. Have you set clear goals for yourself? Have you set clear goals for your family business? Or do you constantly second-guess your actions and decisions in the family business? For our 2018 resource, we chose Simon Sinek’s book Start with Why: How Great Leaders Inspire Everyone to Take Action. I encourage you to join us on March 1st for an event that will help identify your “Why”. Finding your “why” — your purpose — allows you to gain clarity. Having a purpose spurs both focus and action. Focus leads to greater clarity. Clarity is a key component to manifesting happiness. I hope to see you there!